It is once again time to venture out Beyond the Broward. Hope you are having some nice fall weather by now. The autumnal equinox has passed and summer has officially ended. Things are cooling down a bit on the marsh and activity is picking up with more varied bird sightings. I decided to venture to the nearby coast to see what shorebirds I might find. As I start walking down Blackrock trail to the beach, out of the corner of my eye I saw it. Hanging at just above eye level was a huge cobweb with an immense spider. This particular kind is a golden silk-orb weaver, Nephila clavipe, commonly called a Banana Spider. Further towards the beach I could look up between the trees and the entire sky seemed filled with webs and spiders just waiting to snare some unsuspecting insect out for a morning flight. The webs were mostly above eye level but I had to duck a few to get to the beach. One lone Osprey was there to greet me but it quickly left as I approached for a photo op. It probably wouldn’t be appropriate to repeat what I think it said to me. The beach was nearly deserted. Some movement in the rocks catch my eye and finally I spot a Willet walking warily among the rocks (can you say that three times real quickly) in the company of a small sandpiper. As it strolls the beach probing for food, it stops and comes up with a tidbit. I move in for a closer shot and the Willet takes wing and gives me a breathtakingly beautiful full wing profile capture. I decide to also check out the State Park but it is even more deserted except for a family from Ohio who are surf fishing and catch a ray. I take some photos for them of their big catch. Watch out for that tail barb. While on the way home I also had to stop while a gopher tortoise crossed the road. They sure are slow. The secret spoonbill hideout is my next stop. They were there by the dozens. Hope to return there soon and set up a blind if possible. I look up just in time to avoid this Banana Spider and its web. A closer look shows the sky nearly covered with cobwebs and spiders. A flying bug would find it hard to avoid this trap. A lone Osprey sits drying out its wings and trying to cool off. I can't read beaks but had no trouble figuring out what it was saying to me as I approached. It wasn't nice either. A Willit walks warily among the rocks (try to say that three times real fast). The Willet finds a tasty tidbit in the sand.. The Willet prepares to take wing! And I capture my shot of the day..a beautiful full wing profile with reflection. An Ohio family enjoys some surf fishing..they were the only other two legged creatures I saw on the beach. Watch out for that tail barb! 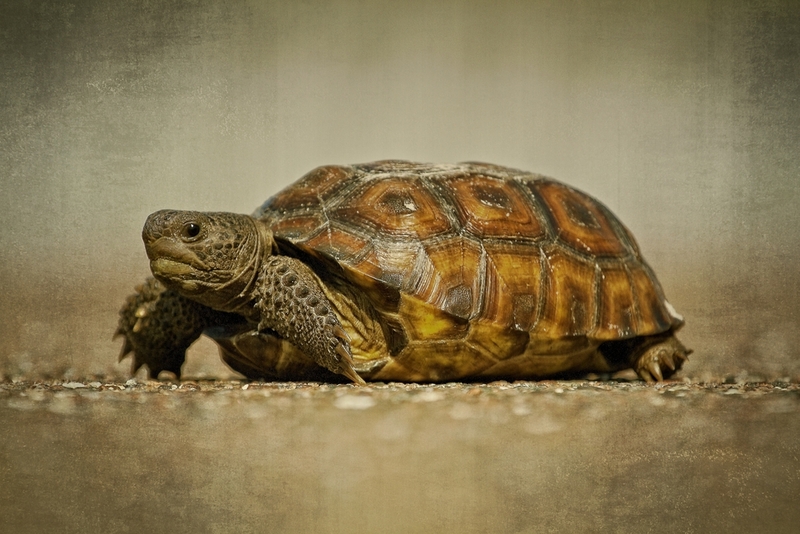 So why did the Gopher Tortoise cross the road? To stop traffic I think. I need to set up a blind at the Secret Spoonbill hideout some time soon. Ever have one of those days (or weeks) when nothing seems to go right? I had one this past week. The framed artwork I sent to the Texas Gulf Coast art show got damaged in shipping. Even though I bought insurance it will be weeks now before the “investigators” determine who was at “fault” and if they are going to pay or not. I shipped it in a special box made for shipping artwork that the show recommended. The Shipper examined it before he sealed it up with the return shipping label and away it went. The art curator said it was damaged when it was opened. Seems clear to me..will let you know how it goes. However, it seems I am not the only one having a bad day…..poor frog. Early this morning I spotted a Roseate Spoonbill feeding up the channel. I anticipated it would come around the channel in my direction so I got down on the floating dock and prone to get some good photos. Sure enough it came feeding in my direction, the large spoon shaped bill sweeping back and forth in the shallow muck. Then it paused. I am looking through my lens at a bird with a real perturbed “look” on its face. The spoonbill gets out of the water, striding quickly through the mud to right across from me on the dock and gives me another look. What it did next can best be described from the photograph below. A picture is worth a thousand words. It proceeds back in the direction it came, paused again, gave me another look and then flew off to the right up to the dock. It did this at the same time George the Yellow Crowned Night Heron was trying to land there also. Fowl words were exchanged. Feathers flew! At least George didn’t get the same treatment I did. Someone was in a Foul Fowl mood today I think. Broward River morning Ansel Adams style..
Every have one of those days when nothing seems to go right said the frog! 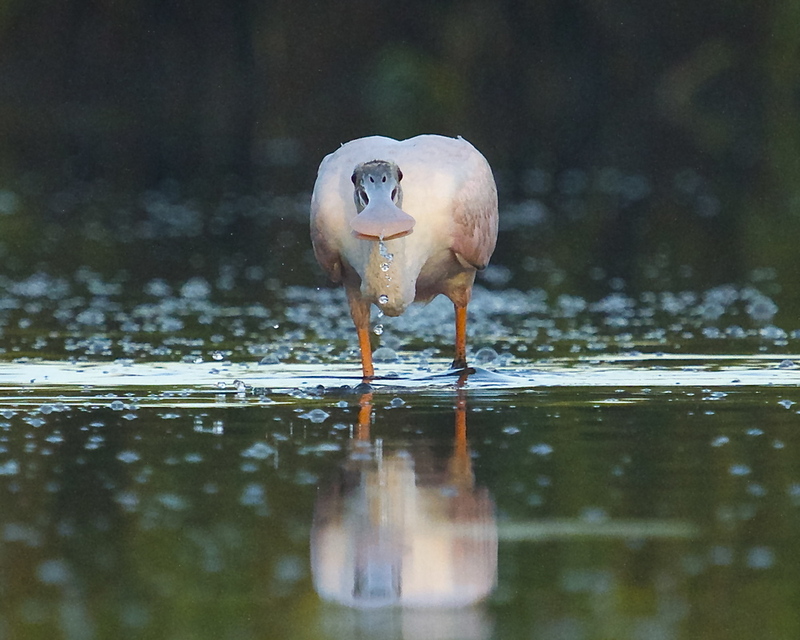 Early in the morning I spot a Roseate Spoonbill feeding in my direction…I get low and ready..here it comes.. I am peering through my lens at a real perturbed looking pink bird.. The spoonbill gets out of the water and marches right up to me. It then proceeds to "express itself" some more…get the picture? Did I make myself clear there Mr Doohickey? In the dawns early golden light and all? Can I get some breakfast now without being bothered? Enough of this Government spying and intrusion. I am going to the dock for some peace and quiet.. The spoonbill makes its approach to the dock..
And people wonder why I don't fly anywhere. Tortoises and elephants used to fly a lot you know..back in the dinosaur era …just too risky nowadays though with the increased air traffic. I travel in this special box car made just for me..hope the cars don't run over me though..
On the 24th of June 2013 (see archives) I introduced you to the epic story of a feud between the Clapper Rail families of the Clappfields and the McRails. I just wanted to follow up on this saga with another update. Although they no longer get into feathered mud brawls there still are some tricks being played out on the Broward between these two families. But now it is mostly all in fun. Here is a little story about Nervous Nellie McRail. Ever since the last family feud ended, little Nellie has been afraid to venture out of the safety of the marsh grass for fear she too might be attacked. Everyone on the Broward calls her Nervous Nellie and pokes fun at her. The Tricolored Heron sees her peek out of the marsh grass early one morning and decides to "pull a few feathers" over her eyes. Hey, Nellie, did you hear the Red Eyed Night Ghost is flying about? Who? Replies Nellie. The Tricolored Heron says “Surely you have heard about the ghost with fiery red eyes who attacks birds in the middle of the night..I heard it was here on the Broward on the full moon last night and scared a whole flock of birds nearly to death. Why look, there goes some birds now…I'll bet the Red Eyed Night Ghost is about. I get shivers up my feathers just thinking about it. “I’m nnnnot scccared of any ole Ghost" says Nellie. "I’m just out here to get a little early sunnnnshine for a ffffew minutes". The Tricolored Heron waits till she goes by then lets out a BOOO! Nellie nearly jumps out of her feathers…"Not funny!" she cries! In the meantime ole sly Clyde Clappfield observes all this from the marsh grass and decides to get in on the action. He waits till Nellie is not looking, starts to hoot-n-holler, then flies out of the marsh and lets out a big screech…Nellie gets so scared she nearly flies out of her feathers again and leaves a large white splotch in the mud. Then she sees it is Clyde. "Nnnot funnnny Clyde..You just wait. I’ll get even with you Clyde Clappfield". And so the saga will continue another time perhaps..Be Blessed. Meet Nervous Nellie McRail…she is scared of her own shadow.. The Tricolored Heron spots her and decides to "pull a few feathers over her eyes"..Nellie, Did you hear about the Red Eyed Night Ghost? The Red Eyed Ghost has fiery red eyes and attack Birds in the night…beware, I hear he is about on this September full moon..
Look, see that flock of birds flying…the Red Eyed Night Ghost is around! I'm not sssscared of no no Ghost.. Oh who is that..ahh just me..whew! We will see about that ….Booo! Nellie nearly jumps out of her feathers! Clyde Clappfield observes Nellie's reaction and decides to get in on the ruse.. I am the Red Eyed Night Ghost…! yells Clyde.. I am coming to EAT YOU! That wasn't funny Clyde Clappfield. Wait till I tell the McRails what you did..you will be sorry. The saga continues..
Mushroom-like clouds rise high in the air as I gaze at the eastern horizon. Are we under attack? Only from the heat it seems. There is no movement at all in the hot humid air hanging over the river. It is only steam clouds rising high in the still morning sky from the various power plants in the area. I anxiously await the arrival of fall like weather on the Broward. Up the channel I spot some movement. This white juvenile slowly begins to stalk along the shallow bank heading in my direction. Its head stopping, then moving a little left, then a little to the right to spot its prey. A brief pause, and then with a lung of the beak, it snatches an unsuspecting shrimp for a quick morning snack. A movement to my left catches my eye as I see a juvenile Yellow Crowned Night Heron land on the bank beside me and also begin to hunt in shallow incoming tide. Both birds soon take wing and I slowly rise, aching from my prolonged prone position. I got a real birds eye view capture though for my aches and pains. A lesson learned from my good friend and photographer Jack Rogers. Mushroom like steam clouds rise in the morning light from the power plants to the east. No, we are not under attack. A juvenile (all white) Little Blue Heron touches down in the marsh channel. It is belly time for me. and snatches a shrimp snack for breakfast..
A juvenile Yellow Crowned Night Heron lands beside me and begins to hunt also.. The Yellow Crowned Night Heron pauses (and reflects)..
A northeasterly breeze blows over the Broward (thanks to Hurricane Cristobol), replacing the warm humid air with a welcome but brief respite from the dog days of August. The Tricolored heron flies right over top of me and lands on his favorite perch about sunset. This feathered watcher surveys the river and seems to say a change and fall is soon coming. September mornings have indeed arrived on this steamy Labor Day. The tides are perfect for an early morning paddle up the river in my wavewalk kayak. I see the fins of a redfish break the surface as I go into the channel leading to the “Secret Hideout” on the Broward. Long white-feathered necks crane to watch me as I make my not so stealthy approach through a narrow channel winding through the marsh grass. At first the Great Egret just warily watches me but soon begins to get nervous and flies over to the nearby tree that is the entrance to the hideout. With a loud protest it then takes wing and heads across the river. But not before I capture the takeoff (sorta). Those wings are just too wide for my camera settings. The confines of the Kayak and a paddle make quick changes a bit more challenging. I decide to return the next morning and find a pair of Roseate Spoonbills in the tree with the Great Egret. Not wanting to spook them I just slowly drift with the current. They seem undisturbed as my doohickey clicks and clicks until at last they say that is enough for today and head off for breakfast. As I return to the dock area I find a few of the Little Blue and Night Herons feeding along the bank. They watch me from the river as I drift ever so close. My battery then blinks its last as my allotted time expires. Like the watchers on the river I too am watching the signs. Another Blood Moon is coming next month. I wonder what will happen next on the world stage of events. As I focus on the eyes of the heron in the setting suns light I wonder what is going on it its thoughts. Just how far can these feathered creatures really see? Do they sense the changes not only in the weather but other things as well? Someday I too will see with that birds eye view. Till then..Be blessed. The Great Egret watches warily as I approach in my kayak. It launches into the bright morning sky.. The next morning I find a pair of Roseate Spoonbills relaxing in the hideout. They just look at me, undisturbed by the click of my doohickey.. Finally they tire of my presence and check their wings and the wind..
Not everyone is thrilled to see me though..
My next challenge is to catch Spunky the Belted Kingfisher up close…Welcome to September on this Labor Day..